(Phys.org) —Mercedes-Benz is to show off its electric car at the New York International Auto Show, open to the public from March 29 to April 7 at the Jacob Javits Center. 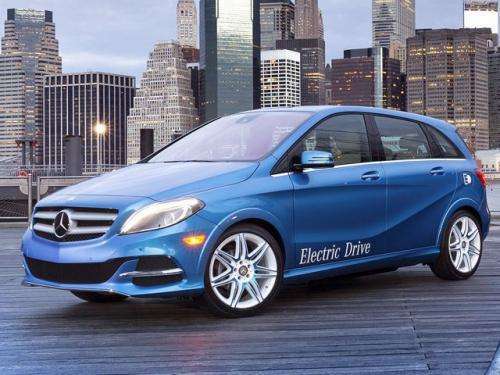 Mercedes-Benz calls its vehicle the B-Class Electric Drive. This is an all-electric five-seater to be available for sale in the U.S. next year. What was MB thinking in coming up with such an unfortunate title for such a good-looking vehicle? Naming it B-Class Electric Drive, while indicating it is one of MB's smaller designs, in a larger context may be confused with a general perception of the letter B as signifying mediocrity, which is not the case with this vehicle. The car maker is positioning it as "the first luxury battery electric car from Mercedes-Benz in the market," one that will give its drivers "electric driving at the premium level." 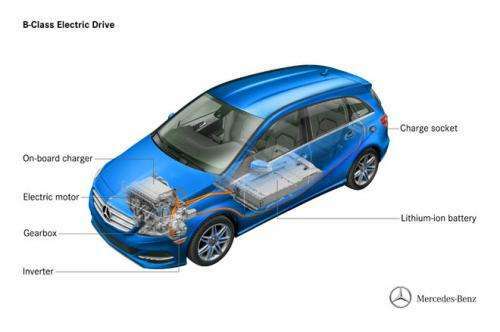 The B-Class Electric Drive is actually based on the B-Class car introduced in 2011, but this time around with special features, from instrumentation to total design. The power display is of note; when power is being consumed, a pointer rises in a clockwise direction from a green to red area, and drops back below the zero line when the vehicle is feeding recuperative energy back into the battery. Three large, round air vents are "sporty" features, according to the company, and above those vents is a display screen. The car's connectivity features include an embedded data connection that allows owners to check battery and charge status via their computer or smartphone. According to the publicity release, the maximum speed is electronically limited to 100 mph (160 km/h) in the interests of operating range. Depending on the driving cycle, the range is around 115 miles (200 km). For a sprint from 0 to 60 mph, the electric car requires less than ten seconds. A lithium ion battery is placed in the vehicle's underfloor, for crash protection. The B-Class Electric Drive can be recharged via standard household power sockets. The charging time for a range of about 60 miles (100 km) is less than two hours at 240 V/40 A. Wired estimated the B-Class will cost in the mid-$30,000 range, but the actual selling price is not yet known. The new B-Class Electric Drive will be available initially in the US from early 2014, and will be launched in European markets after that. Rare earths provided by Communist China. Delivered to Germany by fossil fuel powered conveyance. Energy required for battery construction more than it will every save. Powered by a fossil fuel plant near you. What a joy it is to be ruled by idiots and democrats. Apologies for the redundancy. Actually, Shootist, the B-class uses a Tesla Motors battery pack and electric motors. Meaning, there aren't any rare earths used in the drive train. And it doesn't take more energy to construct the battery pack as it saves. Meaning, there aren't any rare earths used in the drive train. Indeed, the motors are high speed induction motors instead of PM motors, and the lithium comes from Chile and Argentina. However the batteries are most likely manufactured in China, because Tesla uses standard "18650" cells that are mostly made in China. Depends on how you count. From the standpoint of storing energy generated from fossil fuel sources, it saves nothing because energy is lost on the way to the battery, and making a lithium battery consumes about 10% of its lifetime energy storage capacity. Supervisor: "So, why weren't you at work yesterday, Bob?" Bob: "My electric car ran out of power." Supervisor: "Why didn't you plug it in the night before?" Bob: "I did, but we lost power during the night. In the morning I could charge it, and by 10am I thought I had enough power to get to work, but it was cold out and I only got 20 miles." Supervisor: "Then what did you do?" Bob: "I had to call a tow truck, which didn't show up for over an hour. When he wanted $150 I couldn't pay him, so my wife had to drive there from work with cash, but on the way, her car ran out of power too." Supervisor: "Why didn't you just take the gasoline car you still have in the first place?" Bob: "I'm trying to save the planet from global warming." Supervisor: "Well, I'm sorry Bob, but this hospital needs its doctors to be on-time every day." P.S. Bob ran out of power right next to a gas station.
. From the standpoint of storing energy generated from fossil fuel sources, it saves nothing because energy is lost on the way to the battery, and making a lithium battery consumes about 10% of its lifetime energy storage capacity. Which is a highly cherry-picked way to count. Because if you count the energy delivered from the storage to the motor (you know: where it counts) then electric motors are VASTLY more efficient than gasoline ones. So either count the entire chain tank to wheels or don't make a statement at all. Only if you argue wheel-to-wheel AND also posit 100% electricity production from fossil fuels (which is nonsensical) are EVs comparably inefficient to regular cars. And even then they beat them out. If electrical cables were buried in the roadway and induction, or semaphore, used to transfer power, then, and only then, would all electric (non-hybrid) cars be worthwhile. But alas it isn't to be. Drill here, drill now. Hydrocarbons are the fuel of the Now (and the short-term future). Do remember there are no hydrogen mines, so fuel cells are right out (unless you want to crack H2 from ammonia (made from petroleum) or sea water, requiring vast amounts of CHEAP electricity (think fission plants in every city). I don't think we should even discuss mathematical efficiencies of electric motors vs. gasoline engines... that's not the problem, and it's concentrating the comparison in the wrong place. Efficiency as a conveyance system overall is where the meaningful difference lies. A conveyance system that takes 7.3 hours to go 230 miles is not as "efficient" as one that only takes 3.8 hours to go the same distance (and still has 230 more miles left in the gas tank). EV's just can't get the job done. So, next, they will probably be telling us the job doesn't need to be done (or road trips are illegal), and then EV's are okay. Watch for that. Oh, 7.3 hours for 230 miles is assuming you start with a full charge. If you just got back from work, you'll need to charge up first. 9 hrs. Which is another cherry picked way of cvomparison. How often a day do you go 230 miles (or even per week, or even per month)...Once? Maybe. When was the last time you made a road trip. Lemme guess: never. The vast majority of uses for a car are short trips. Work, shopping, taking the kids somewhere. Eikka: Tesla uses Panasonic cells, manufactured in Korea. I have been driving a Toyota RAV4 EV for just over a month, it seems to use the same Tesla designed power train as the Mercedes. Got to say it but the range anxiety is there, small annoyance like "is the charging plug fully in - click" (as a habit I double check via a droid app that it is in fact charging)ARE WAY OFFSET by no longer dealing with stopping for gas and car pool lane access. That said, we have a second car in our household - a hybrid. No they don't. Electric cars using today's average energy mix in Europe are pretty much neck and neck with ordinary gasoline vehicles and lose out to diesel cars in terms of efficiency. And that's before you take into account the lifecycle cost of batteries, which is about 10% of the energy that gets charged up in them. How often a day do you go 230 miles (or even per week, or even per month)...Once? That's not really the real issue. Electric cars need more range because they lose range over time. Sorry, fudged up the figures in the above post while entering them into the calculator. From 2000 cycles or 10 years to 65% capacity, at 250 Wh/mi, and 15.000 mi/year, you go from 115 miles or 184 kilometers (not 200!) on the new car to 35 mi / 57 km in ten years on the old car. And that is if you believe in what the manufacturer says the car will do. If we take less optimistic range of 100 miles and 320 Wh/mi for the energy consumption, then we go from 100 to 20 miles of range in ten years. The car would barely reach 60 miles at year five. Would you two mind shutting the F up with all your cherry picked lies and crap and JUST DON'T BUY AN EV. Nobody is holding a gun to your head and asking you to so just SHUT THE F UP. Hey, everyone, I don't like pickup trucks, they're not efficient, you don't need them to haul crap 99% of the time and they're ugly. And since I don't like them, then none of you should and I'm going to sit here and write stupid SHYTE about them every time you guys turn around...just to be an annoying PRIG like Eikka and Quixote. Guys, if you don't like it, then SHUT THE F UP AND DON'T BUY ONE. BUT LEAVE THE REST OF US ALONE. I have driven over 230 miles in a single day more times than I can remember--many times without stopping so I could beat the weather. Sorry, but I just don't think people should blindly accept EV technology as a replacement for gasoline cars (which is how they are being marketed). The vast majority uses cars for short trips? That doesn't solve the problem. People forget to charge their precious cell phones. There will be soccer moms stranded everywhere because they drove the kids to the field w/o enough charge (or because it was a cold day). What about the one time you need to drive 230 miles in 5 hours? For that to all of a sudden be an impossible task is an atrocity. Why have my valid comments made you so upset? If you take the time to consider what I'm saying you'll see that my points are neither cherry-picked nor lies. I am simply the voice of reason trying to shed light on what this article fails to cover. If you want an EV just because you think it's cool, and you want to pretend you live in Star Trek or something, that's awesome. But the moment regular people start replacing their gasoline cars with EVs, their ability to get around is severely hampered and complicated. It's so backwards. It's restricting freedom of movement if nothing else, and that's unacceptable. When EVs can go 300 miles on a single charge (and only take 5 minutes to re-charge) then you'll have something. Not everyone needs to drive that far... but with a gasoline car, one CAN. That's hugely useful (aka normal).